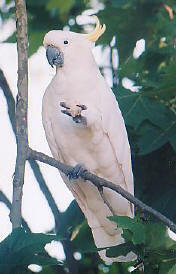 Probably the most familiar of all cockatoos. It is a large all white parrot with a yellow crest. They occur in the south east, along the east coast, and across northern tropical Australia. Like many parrots, they are very sociable birds, often seen travelling in huge flocks above the rainforest canopy, and coming to roost at night in large numbers in particular trees. While these birds can often sit quietly in the treetops, they are often noticed because they are such a loud bird with an awesome screech made as an alarm call. Here it may be observed feeding on the small hard fruits of the Alphitonia.